All the trees are recorded under a Site Number with 128 sites identified by field, spinney, road, garden or public space. All trees are given a number, recorded in duplicate on a Tree Recording Form with one set to the Community Heritage Initiative based at Holly Hayes in Birstall and one that I retain for the parish. 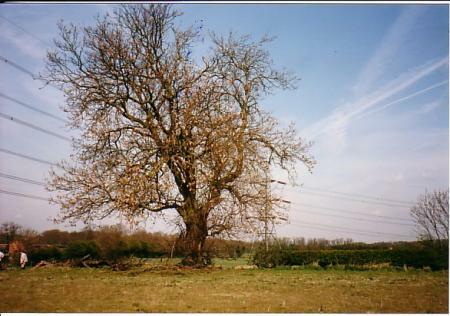 The following is a general record of the Rothley Trees at February 2006. 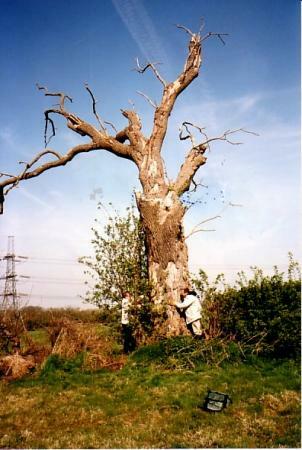 Ancient Trees are those with a girth at chest height of a minimum of 3.77 metres, Ash with a minimum of 3 metres and others that are classed as Ancient without a minimum girth due to species or interest. Smaller trees have been included in my records as they are our future. 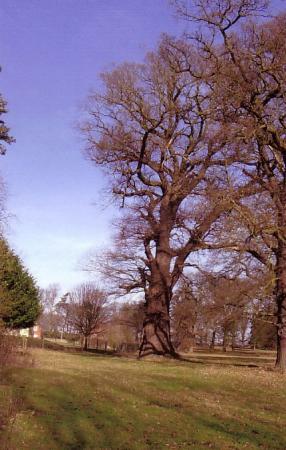 Greatest Oak has a girth of 7.51 metres (24ft 8in). 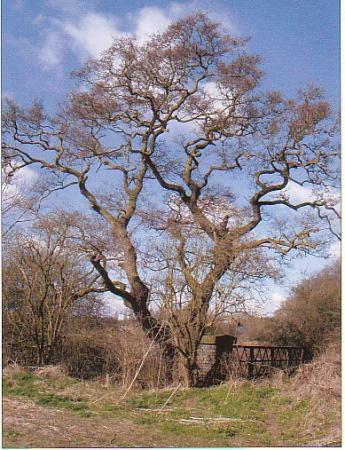 The Greatest Ash off Swithland Lane shown above and what is happening to our Ancient Ash shown below. 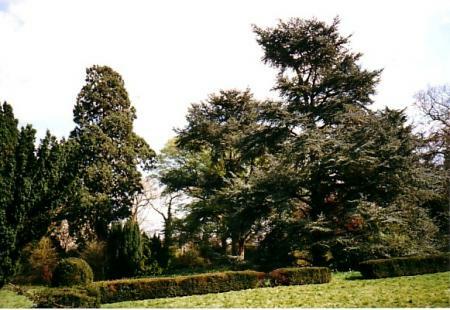 Greatest Wellingtonia is in the grounds of The Grange on the left of the above photo and its girth shown below. Greatest Wellingtonia has a girth of 6 metres (23ft 6in). 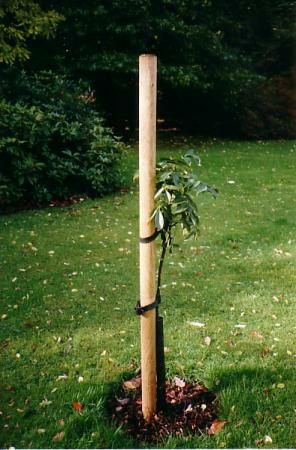 Greatest Lime has a girth of 4.2 metres (13ft 5in) shown above. 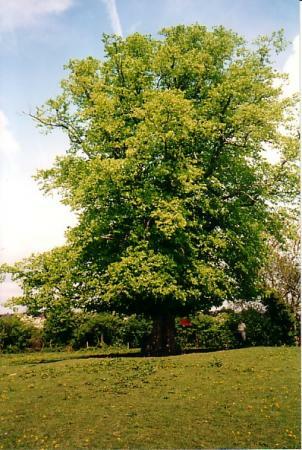 The only recorded Green Beech to date will be ancient one day. 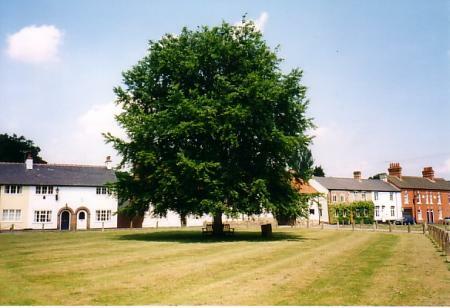 This is the Coronation Beech, shown above, on Town Green and therefore of historical value. 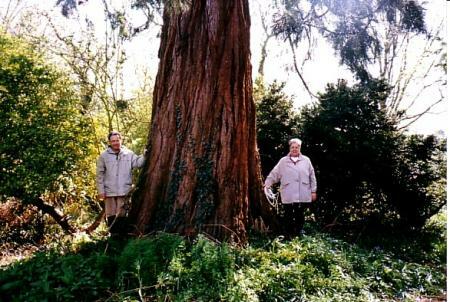 It was planted in 1953 and has a girth of 1.9 metres. 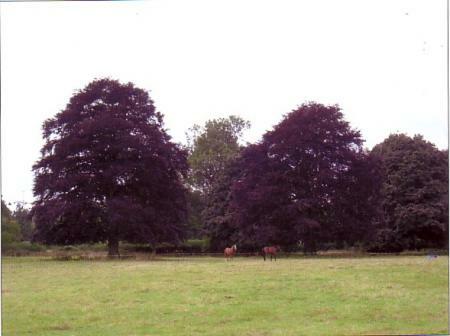 Greatest Copper Beech, one of the pair shown above, has a girth of 4.98 metres (16ft 6in). 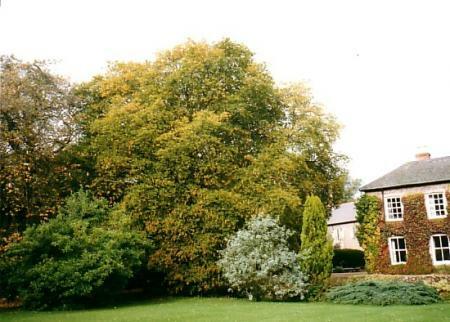 Only 1 Ancient Hornbeam, shown above, recorded to date with a girth of 5.1 metres (16ft 6in). The huge trunk is shown below. Recorded Ancient Horse Chestnuts 3. Horse Chestnuts up to 3.7 metres 11. 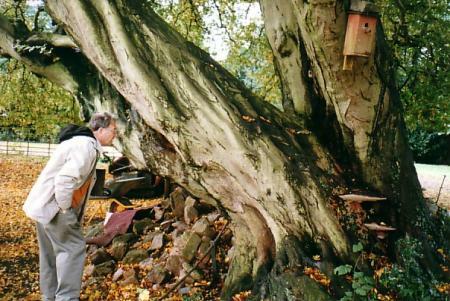 Greatest Horse Chestnut has a girth of 4.3 metres (13ft 10in). 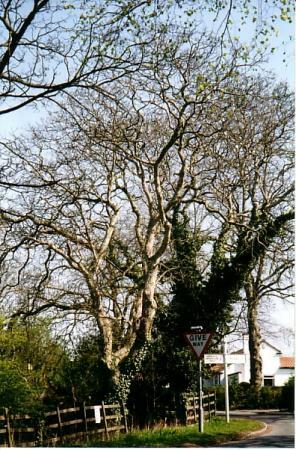 The Greatest Walnut shown above and a group of walnuts below at The Ridings and Swithland Lane cross-roads. Recorded Ancient Walnuts 8 (Ancient Walnuts have a minimum girth of 1.22 metres). 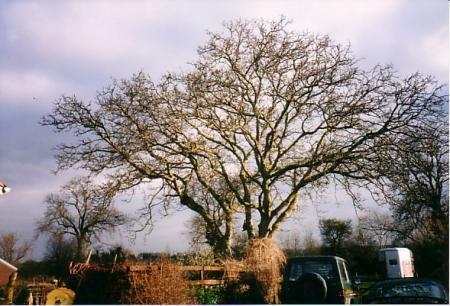 Greatest Walnut has a girth of 3.2 metres (10ft 6in). Horticultural Research International based in Kent is building up a record of all the Walnuts in Britain and looking for those with a girth of 4ft or more as they make excellent 'parent' trees from which they can take graft wood for breeding saplings for future Walnut forests. The Rothley trees have been recorded on their database. Other Willows up to a girth of 3.7 metres 7. The above Alder is on the banks of Rothley Brook and has a girth of 2.7m. It is Tree 231 in the Ancient Tree Survey. Records also made for Maple, Hawthorn, Poplar sp., Silver Birch and Sycamore. 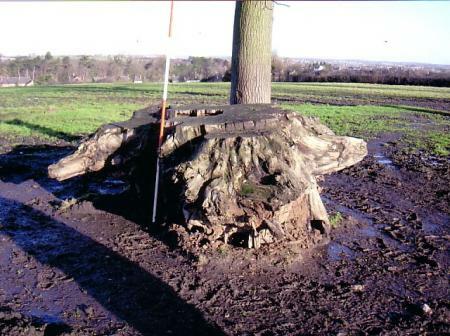 The stump of one of the greatest oaks in 2005. It has a girth of 6.55m. 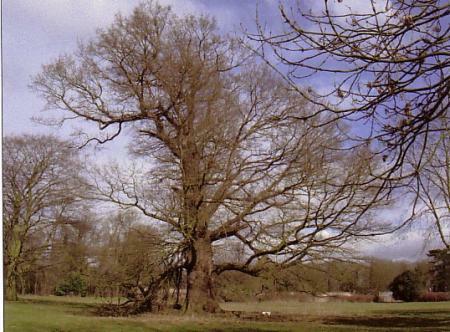 The reason for recording our Ancient Trees of Rothley. There are still many to be recorded to give a complete picture of our trees, not just for species, but their ability to survive as Ancient Trees of the future.